Starting in April, Kevin Brownlee will share with visitors interesting facts about his work at The Museum and the research he is conducting. You may subscribe to the RSS feed so you will never miss a post! Presentation at Special Area Groups (SAG) session on Creating a Space for Aboriginal Perspective (Council for Aboriginal Education of Manitoba Aboriginal Education): Kevin Brownlee and Leigh Syms, “Digging Deep: the Uses of Archaeology,” Winnipeg (Oct. 23, 2009). Presentation at Chacmool Conference (University of Calgary): Kevin Brownlee, “Nation Building through Archaeology,” Calgary (Nov. 12-15, 2009). Presentations at Manitoba Archaeological Society (MAS) Annual Conference in Swan River, MB (Nov. 20-22, 2009): “Hitting Rock Bottom: Current Research in Granville Lake” (Kevin Brownlee) and “From Pieces to Pots: The How and Why of Ceramic Vessel Reconstruction” (Morgan Tamplin, Kevin Brownlee, Leigh Syms, Andrew Fallak and Myra Sitchon). Submitted and received results from AMS dating on materials collected during summer field season. Research on ceramics from Sipiwesk Lake, South Indian Lake, Nelson House and The Pas for publication with volunteer assistance. Completed review of three illustrations of ceramics for ceramics manuscript prepared for Sipiwesk Lake Archaeology Project. Kevin Brownlee obtained his Master’s Degree in Anthropology from the University of Manitoba. He was hired as the Curator of Archaeology at the Manitoba Museum in 2003. 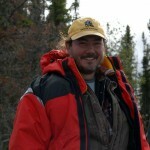 His research focuses on the archaeology of Manitoba’s boreal forest and the emerging filed of indigenous archaeology.